Lunch with Vandelay can be dangerous at times. You see, he loves to eat (possibly more than me!) and when he does, he goes all out. When he eats ramen, it can only be the fatty pork. If it is a smoked meat sammie, it has to be full fat. And when he has pork belly, there is no wastage at all, the whole thing goes in his mouth. For people who really know food, Vandelay is doing it right. But if we look at healthy eating, this would be the complete antithesis. Hence, whenever I'm out for eats with him, it sets me further back if there is a blood test on the horizon. So I suggested to him that we should eat "healthy" for once. How about Shizen Ya? They serve good-for-you Japanese food right? Vandelay reluctantly agreed and as we were walking up Nelson, our attention took a sharp detour to the left. What's this? A new restaurant right next to Relish? Oh no, here we go again... We went from healthy eats to non-healthy in a blink of an eye. Curse you Vandelay! 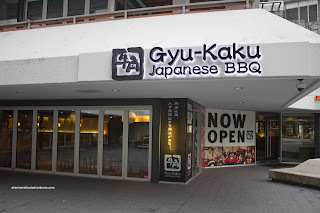 Apparently, there is now a Gyu-Kaku Japanese BBQ in Vancouver. 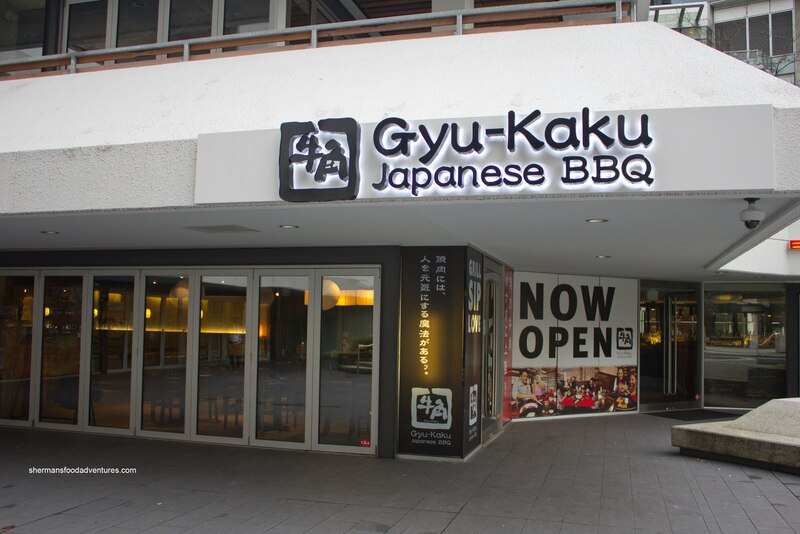 With over 700 locations worldwide, this is a serious chain restaurant. 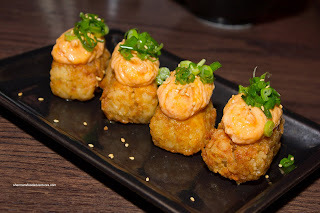 As such, we would naturally go for the BBQ, but first, we had a few appies. Incidentally, all of them were fried. Curse you again Vandelay! So we started with the Spicy Salmon Volcano which was a whipped salmon and spicy mayo concoction sitting atop fried sushi rice. I would say the best way to describe it was "interesting". I wasn't really fond of the fried sushi rice. It was a touch too hard and gummy. The salmon "mousse" on top was slightly spicy and sweet. 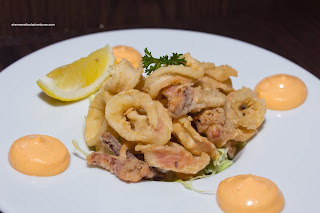 Up next was the Fried Calamari with chili mayo dolloped on the plate. This was good. The squid was tender and still moist while the batter was crispy and light. Dipped into the chili mayo, it was a pleasant experience (not sure if this is the right way to describe it, but we were indeed feeling pleasant...). 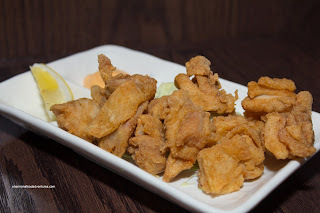 For our last appie, we had the Chicken Karaage which consisted of boneless dark meat pieces. 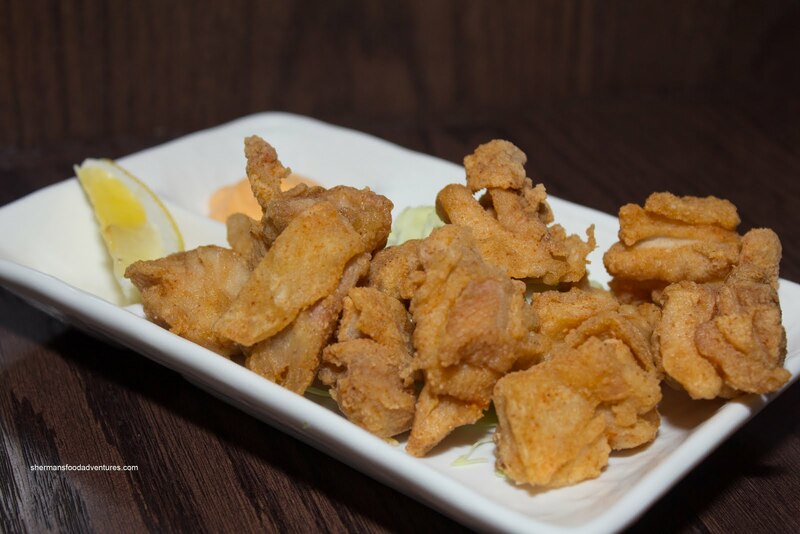 These were fried up perfectly crisp while the meat was moist and juicy. There was a proper amount of salt which added enough flavour. After our fried food tour, we then proceeded to the fatty meat portion of the meal. Curse you Vandelay! We settled on the Meat Lover's set meal which included rice, soup and salad. 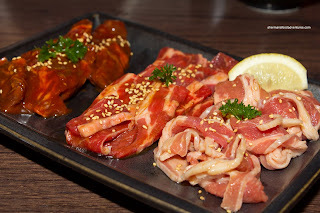 The meats on the plate consisted of Toro Beef, Chuck Kalbi and Bistro Harami. We thought the portion size for the price was fair especially considering the quality of the meat. When cooked on the BBQ, the meats were tender and properly seasoned. Probably the best thing going for them are their super hot and effective BBQs. 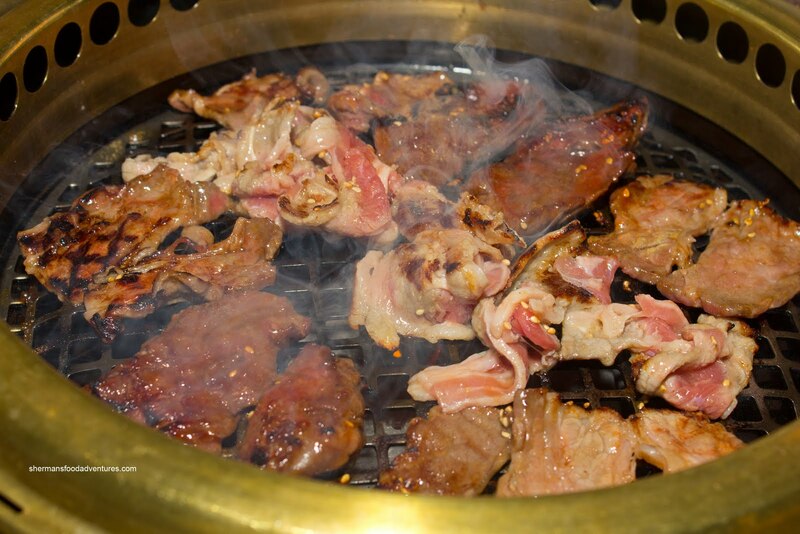 It may look like Korean BBQ, but believe me, these are some of the most powerful and even-temperature table BBQs I've ever cooked on in a restaurant. No dead spots and barely any meat sticking to the cooking grate. Furthermore, the ventilation worked well in dissipating the large amount of smoke emanating from the BBQ. Hey, the meal was good. Nothing Earth-shattering, but solid nonetheless. Healthy? Well, that would be up for debate wouldn't it? Curse you Vandelay! Other than the awesome BBQs, the most memorable thing was the service. It was super-attentive to the point of being almost intrusive. Yet, we'd take that over crappy service any day.